Love is certainly in the air. It always seems to happen this time of year. Couples plan adorable little trips (or at least dinner), little ones pass pink and red notes and candies, teens fall in and out of love pretty much every day… There is something about the nip in the air, and the coming of warmer weather that makes everything turn cheerful and pink. 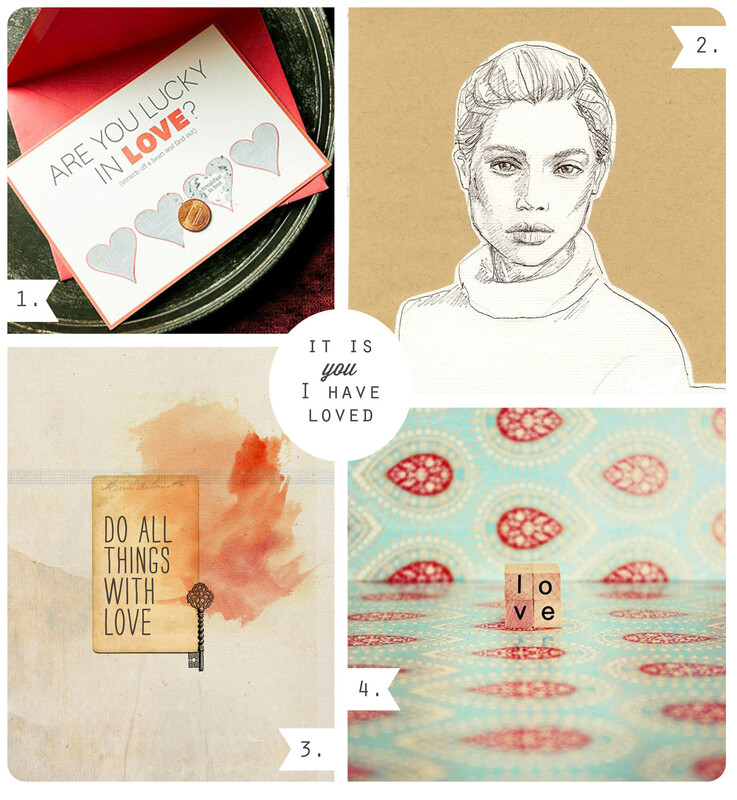 So how could I resist putting together a little collection of beautifully designed, well created, valentines inspired pieces with you? 1. Cutest Valentines day card ever. Scratch off hearts cover various date night activities (or any other sweet, romantic options.) Designed by the brilliant crew at BHG and they provide full DIY instructions! A printer, a little white acrylic paint, and you’re good to go! 2. This stunning, eye catching, completely beautiful portrait was done by linda Tinfena of TinfenaStudio. I love the drawn, portrait, silhouetted by the rustic brown paper “background.” This piece is so well done, and there is so much to observe in the face of this beautiful girl. I wonder what her story is? 3. If you have an iPad this needs to be your new background because it fits perfectly completely amazing! Otherwise it is also a wonderfully beautiful collage that you could easily stare at for an hour and not get bored. Check out the Oh, Hello Friends blog to see this and the coordinating desktop calendars designed by the oh-so talented Danni! So chic. 4. l o v e Oh goodness this photograph is adorable. There is something so sweet and peaceful about the layout and composition of this piece. I love the pattern and colors, and the simple message hidden in this photo… it’s all so beautiful. Taken by the very talented, DC based photographer Jessica Caso. Her shop, Metro Line 6 Photography is named after her time in Paris (living near Metro line 6!) and is full of inspired photographs. …and speaking of DC, when you read this I should be just waking up to a fun-filled day in America’s favorite city. Follow our adventures on the Beautiful Hello Facebook Page! I’ll be updating with photos often! What program do you use to add text etc to your photos? I love the look but haven’t found anything the suits my needs. Your blog is adorable! Looking forward to visiting your Etsy site! Thanks for enjoying beautifulhello! I use a combination of Adobe CS5 programs to create these collages. My go-to programs are photoshop and illustrator. They’re rarely not open when my computer is on because they work so perfectly. 🙂 Hope this helps! Thank you Joujaa! I have fun playing around with them.